Today the Northern Territory Chief Minister announced a process to enable pastoralists to enter into agreements with mining, oil and gas companies before entry to their land for significant exploration activities. Through mandatory access agreements, for the first time pastoralists will be provided the right to have a seat at the table to negotiate a range of issues pertaining to others entering and accessing resources on their land. The landmark announcement provided details of the arrangements agreed between the parties which now require mandatory access agreements to be signed prior to significant exploration, mining or extraction of resources on pastoral land. These new arrangements make it mandatory for both parties to agree on conditions of access on fundamental issues including weed management, fire, water, biosecurity, chemical use, erosion control and livestock and human health and wellbeing. While these new arrangements are a significant step they do not provide a right of veto over exploration or extraction. “The Chief Minister has shown great leadership, against a culture of resistance, to listen to concerns raised by pastoralists, land holders and the broader community. 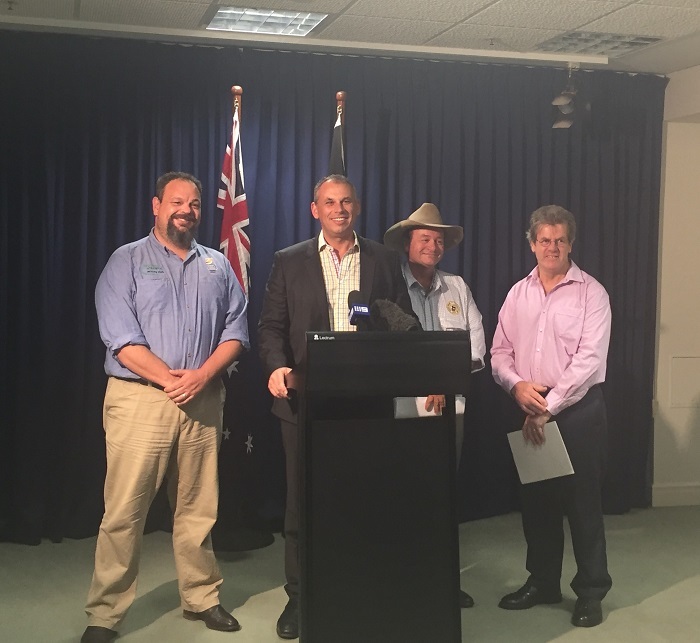 It also is an acknowledgement of the need to ensure the integrity of the pastoral and food production industry for generations to come,” said NTCA President Tom Stockwell. “Until now there has been no requirement for any agreement and pastoralists have had little capacity to manage their land, animals and livelihoods when mining and resource companies arrive on the door step,” said Mr. Stockwell. This sets a baseline for how relationships will be managed and the rights of pastoralists and resource companies will be clarified and more secure. We think it is an opportunity that provides greater certainty for the mining, oil and gas sector and the pastoral industry which will be here for many generations to come. The Northern Territory Cattlemen’s Association is the peak primary industry body representing 90% of the Territory’s cattle industry, from small family operations, to the large corporate organisations. Our Northern Territory members manage a landmass in excess of 680,000 square kilometres (45% of the NT Landmass) with a cattle herd in excess of 2 million. The NTCA provides leadership in pastoral land conservation, market development and trade, regional development, Indigenous employment and engagement. By area, employment and economic contribution the pastoral industry is the dominate industry in land management in the NT, with a predominate focus on long term sustainable production. NT producers supply cattle to all states and territories of Australia and produce quality animals suited for the growing live export trade to South East Asia.